You might be surprised to learn you actually have two options for miniature golf at Disney World. The first is Fantasia Gardens, which is inspired by the Disney classic film Fantasia. Winter Summerland is the second option and is designed around a Holiday theme and is located near the Blizzard Beach water park. Both of these parks offer 36 holes for those craving an expansive mini-golf experience. 36 holes may seem like a lot, and in fact both courses are charged in 18 hole increments. The current fee as of this writing is $12 for an adult and $10 for young children. So if you want to play all 36 holes, and adult would have to pay $24. While this may seem a bit steep, like everything in Disney World the price is justified by the excellent presentation and implementation. Also note that Annual Passholders can get discounts of up to 50%. Groups are spaced out so you may have to wait a few minutes to start your round, but generally the wait is not more than 30 minutes, even at peak times. An 18 hole round can take anywhere from about one to two hours in a typical case. Fantasia Gardens is located within the Epcot Resort area. 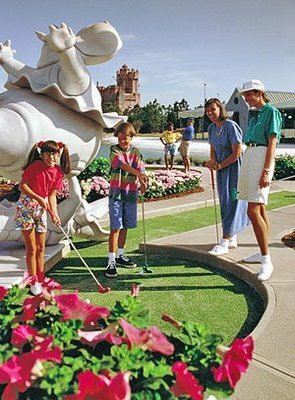 The first 18 holes, Fantasia Gardens are a fairly standard, if impressively themed mini-golf course. The second 18 holes, called Fantasia Fairways are more like a true golf course, except on a miniature scale. Fantasia Fairways is generally the more difficult of the two and may appeal more to full-scale golfers. In fact it was voted the longest and most difficult mini-golf course in the world by Golf Digest. The story behind Winter Summerland is that it was built by Santa’s elves. The elves however had differing opinions on the preferable environment for the courses. Thus 18 holes of one course are in a summery setting, while the other 18 are in a wintry setting. Neither the Winter course nor the Summer course are as challenging as Fantasia Fairways and are intended more for casual mini-golfers. Either of these courses can be an enjoyable activity if you’ve gotten worn out of the crowds in the parks. You can even reserve a tee-time for later in the day if you’re worried about the wait. Do be aware that there are no buses directly to the courses. However you can get near them either by taking the Blizzard Beach bus for Winter Summerland and the Swan & Dolphin bus for Fantasia Gardens. For those looking for a change of pace on their Disney vacation, these can be a great option. This entry was posted on Monday, June 14th, 2010 at 8:38 pm	and is filed under Theme Parks. You can follow any responses to this entry through the RSS 2.0 feed. You can leave a response, or trackback from your own site.